Introducing Hyper-V 3.0 Microsoft added some new features which allows for better virtualization management for Domain Controllers. From now, you don’t have to affraid USN Rollback when you restore your DC from snapshot or when you use DC’s clone in your environment. New Hyper-V 3.0 is “smarter” and it secures your environment. 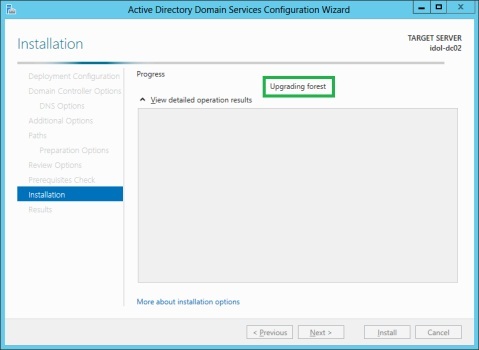 Thanks to that, you may use new feature for rapid DC deployment from the existing Domain Controller. You need to only allow cloning DC, adding it into appropriate domain group and prepare some XML config file with PowerShell v3.0 cmd-let. Then you can safely clone new DCs from the existing one(s). In virtualized domain environments, this feature is also really good for disaster forest/domain recovery. Important! To be able to use the new feature, you need at least one Windows Server 2012 Domain Controller on which you hold PDC Emulator operation master role. With Windows Server 2012, Microsoft presented new Windows activation method. This method is called Active Directory Based Authentication. That is available in Volume Activation Services role when you run Server Manager. When you use Windows 8 in your environment, you can simply activate it when client is being joined to the domain. It happens automatically, you don’t need to put an activation key and there is no need to access the Internet. This much more secures your environment in comparison to KMS server. When KMS was present in the environment, you need to only know server name on which it was running (there is also other method for that but I would not describe it here and you can simply activate your Windows copy. Now, with AD BA you need to add client to the domain to allow for OS activation. It is also important to limit users in your environment with permission for joining computers into domain. Of course, you can still use KMS server for that. It is suported by AD BA. However, it is required for previous Windows OSes. AD BA may be only used for Windows 8 activation! Microsoft improved RID FSMO role in Windows Server 2012. The most know improvement in this role is its RID pool incrementation. Previously we had 2^30 available RIDs and now we have one bit more 2^31. This bit incremented pool from one billion to two billions of RIDs. Thanks to that improvement we have doubled RID’s pool. But we need to know one important thing. If we want to use that, we need to have Windows Server 2012 Domain Controllers or Windows Server 2008R2 with appropriate hotfix installed. Other Windows versions do not support extended RID pool. Remember! 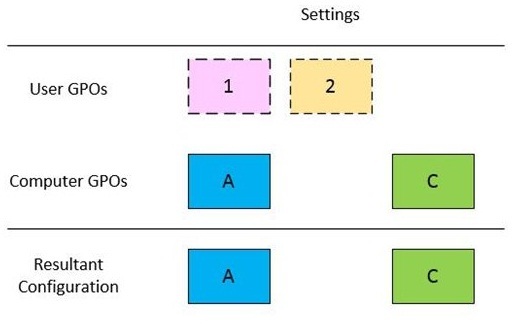 Extended RID pool may be used only by Windows Server 2012 and Windows Server 2008R2 with appropriate hotfix installed. 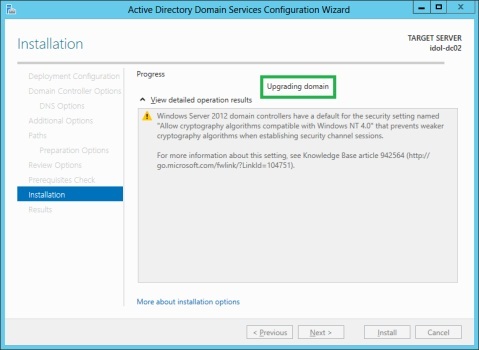 Additionally, you need to have RID Operation Master role on Windows Server 2012 Domain Controller! 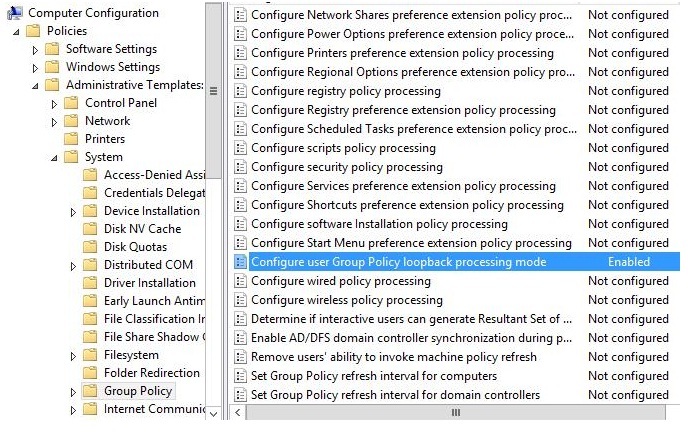 Another great thing introduced with Windows Server 2012 is RID Pool re-use feature! Microsoft did not fix RID leak issue which happens mostly when you are creating new users in a script mode. When password set up by script does not meet domain password criteria, object cannot be created successfully and RID is lost. In case that your script was prepared to create many user objects, you are loosing many RIDs. With Windows Server 2012 on which RID Operation Master is held, those RIDs are going to RID Pool re-use. This pool catches all those RIDs and uses them for the next objects which are created. If pool is empty then standard RID is used from global DC’s pool. Important! RID Pool re-use is only available until you will restart Domain Controller. After server reboot that pool is empty! In Windows Server 2012 Microsoft introduced also event logging for used RIDs. The first entry will appear when RID consumes 100.000.000 (10% of pool). Another entry will be recorded when 10% of remaining pool will be used (in this case 1.000.000.000 – 100.000.000 = 900.000.000 and 10% from remaining pool is 90.000.000). Events are recorded every 10% consumption of remaining pool. Smaller RIDs pool more frequent logs in Event log. Microsoft changed also, possibility to issue large pool of RIDs from RID Master to other Domain Controllers. By default RIDs are delivered in 500 in a pool for each Domain Controller. Administrator is able to change that value in registry but when he/she sets up too high value, RIDs may be exhausted in short time. In Windows Server 2012 Microsoft limited maximum amount of RIDs to issue. The maximum pool allowed for distribution is 15.000 (decimal). When you set up higher value in the registry, it won’t be issued to Domain Controller(s) because new mechanism will issue maximum 15.000 RIDs in a pool. One more interesting thing introduced in new RID Mater FSMO role is RID Manager artificial ceiling protection mechanism. Microsoft knows that administrators do not read event log frequently and even if they read it, they do not react too fast to solve the issue recorded in Event log. They implemented new mechanism which blocks RID distribution when its pool exceeds 90%. From that point, RID Master does not issue any pool to other Domain Controllers. Administrator must manually unlock this. That mechanism informs administrator about pool exhaustion (90% RIDs in general pool are used) and informs that additional activity may be required to prevent complete exhausting RID pool. 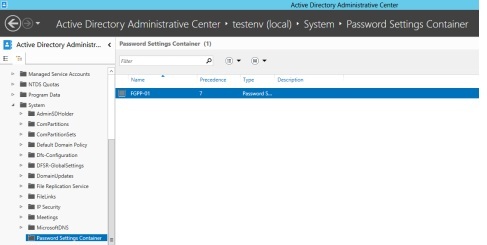 Some new features or improvements in Windows server 2012 Active directory. 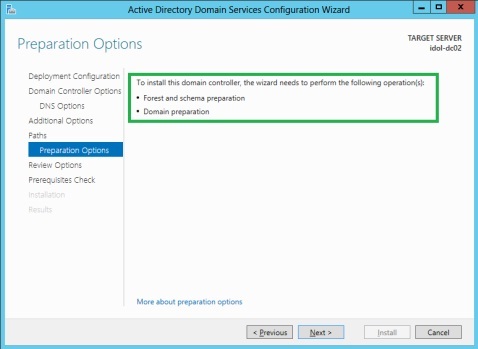 Microsoft simplified Domain Controller promotion process as much as they can. In Windows Server 2012 they do a real great improvement. Domain Controller promotion process allows much more simple introduction of the first Windows Server 2012 DC in your existing domain environment. You don’t have to extend your schema and prepare domain environment for the first Windows Server 2012 Domain Controller. Previously, you had to extend schema and prepare domain using adprep manually with appropriate switches before you were able to promote DC based on newer operating system. Also dcpromo known from previous Windows v ersions is no longer used for server promotion. That command is integrated with new Windows Server Manager. Whole process for Windows Server 2012 Domain Controller introduction in the existing environment is based on GUI wizard in Server Manager. You need to only be logged on with appropriate permissions and you can start the process very quickly. 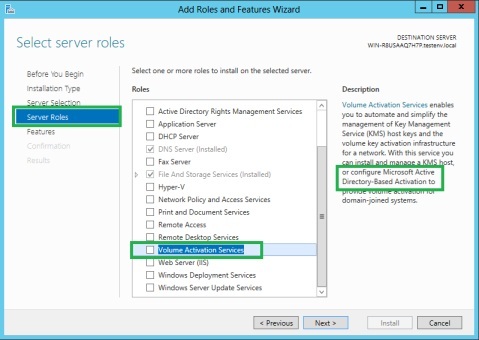 Just add Active Directory: Domain Services role from the new manager and after all, follow post-installation steps in notification area. When you are promoting new DC, you are informed that wizard extends schema and prepares domain for the new Domain Controller. As I mentioned above, dcpromo cannot be used for DC promotion as it was in the previous versions of Windows. It is integrated with Server Manager and if you try to run it from command-line, you will see that it is not possible and you have to run the process from new manager. Note! You need to know that everything you will do in Server Manager is translated to PowerShell v3.0 code and run in the background. The same situation is for Fine-Grained Password Policy, you don’t have to use ADSI Edit or PowerShell to create new PSO. This is also available over GUI method in ADAC console. Everything what you do in Active Directory Administrative Center is also translated into PowerShell v3.0 code and run in the background. In this case, ADAC has implemented new feature called PowerShell History viewer which allows you to see cmd-lets used for action and whole syntax. You can copy it into notepad and modify to run it later. This is really good method to learn PowerShell. Completely new feature in Windows Server 2012 is Dynamic Access Controll. It is responsible for simplified management of claims in AD and allows to extend FileServer permissions out of standard ACL method. 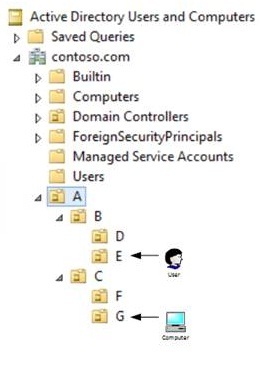 User does not need to be a member of many groups in Active Directory, You can allow him/her access to resources over claims in combination with DAC. 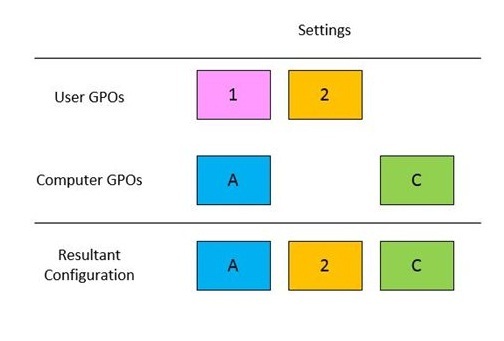 This option reduces Kerberos token size which is really important in large domain environments where user is a member of many groups. When some object is deleted on a DC it is changed into a tombstone. When an object is transformed into a tombstone ALL almost attributes values, except those mandatory and additionally manually configured, are stripped from the deleted object. objectGUID, objectSid, nTSecurityDescriptor and uSNChanged. Configure the “searchFlags” property of the attribute which consists of bits, each with a certain meaning! Don’t just change this without knowing what you are doing!!! Enabling the FOURTH bit on the “searchFlags” property preserves the attribute value in the tombstone of the deleted objects. 4th bit: 2^3=8 <——this one! A process on each DC called the “Garbage Collection Process” runs each 12 hours and checks, amongst other activities, if tombstones are older than the configured “tombstone lifetime period” they are removed from the directory forever! (nothing to worry as this is a normal process and it should work this ways!) That removal does not replicate to others DCs, but each DC on its own does this check. So now let’s look at HOW lingering objects occur! Lingering objects occur when a DC/GC is not available (e.g. due to network connectivity issues or DNS issues or it has been shutdown or whatever) for more than the “tombstone lifetime period”. Because of that, that particular DC/GC is not able to replicate at least once within the “tombstone lifetime period” to receive the tombstones. If the unavailable/disconnected DC/GC becomes available again after the “tombstone lifetime period” has passed, inconsistencies (may… but probable will) exist between DCs/GCs, which might cause security related issues, replication issues and even loss of functionality. Whether or not the lingering objects replicate back to the other DCs/GCs depends on how the two defense mechanisms (for W2K3 and later) against lingering objects are configured. W2K DCs only have one defense mechanism, being option 2. When a DC/GC does not replicate at least once within the “tombstone lifetime period” with other DCs/GCs, replication is halted with that DC. This defense is NOT in place when the following registry name is available and set to a value of 1 (one). When strict replication is enabled on a DC/GC the inbound replication of lingering objects is halted and reported (event ID 1988 in the Directory Service event log) for the partition that contains the lingering object. When loose replication is enabled on a DC/GC the inbound replication of lingering objects is NOT halted but it is reported (event ID 1388 in the Directory Service event log). Lingering objects can be detected on DCs by either looking for event ID 1388 or event ID 1988 on DCs/GCs using, amogst others, the EventCombMT tool (Resource Kit). This defense is NOT in place when the following registry name is NOT available or it is set to a value of 0 (zero). This event ID will only be logged on the DC when an attempt is made to inbound replicate the lingering object from the DC containing the lingering object. That attempt will be triggered when a changed is made on the lingering object on the DC containing the lingering object. STRICT replication consistency MUST be enabled for the following to work. On the DC/GC containing the lingering objects the event IDs 1938 (starting detection summary), 1946 (for each lingering object detected) and 1942 (final detection summary) are registered in the Directory Service event log. On the DC containing the lingering objects the event IDs 1937 (starting removal summary), 1945 (for each lingering object detected and removed) and 1939 (final removal summary) are registered in the Directory Service event log. Don’t enable LOOSE replication (because of security issues with re-introduced objects that should have been deleted) as this really does not solve the real problem. It only extends it! Make sure you MONITOR end-to-end AD and SYSVOL replication between DCs!!! Should be a MUST on your priority list!!! Make sure you MONITOR DC/BH/GC/FSMO availability and detect disconnected DCs ASAP!!! Monitoring is a preventive measure that helps you NOT getting the headaches you may have now concerning lingering objects! I have created some scripts (see the zip file at the end of the post where it says ‘attachments’) that automate this a bit more. Use them as you wish and at your own risk!!! Get there scripts from HERE. Were these scripts useful? Just say: Thanks! These scripts are freeware. Use it as you wish at your own risk. Make sure you test these scripts FIRST in a test environment! If you don’t know how to use the scripts DON’T USE them! –> This procedure works for both W2K and W2K3 DCs!!! The following has been copied from the URL below, for those who are interested to know how the “/removelingeringobjects” works. Strict Replication Consistency is a registry value that prevents destination domain controllers (DC) from replicating in lingering objects. Lingering objects are objects that have been deleted on one DC but replication failures prevent a partner DC learning of the deletion. The result is those deleted objects remain “live” on the replication partners. If the replication failure persists for longer than tombstone lifetime but is later corrected, the DC that failed to inbound replicate the deletions will continue to have “live”/lingering objects in its copy of the AD database. When one or more attributes are modified on these “live” objects, that object must replicate outbound. DCs that don’t have Strict Replication Consistency enforced will replicate in these formerly deleted objects, re-animating them. If to the you want new domain controllers added forest to have strict replication consistency automatically enabled, you can import the Operational GUID cited below to the Configuration directory partition using Ldifde.exe. The presence of this object in the Configuration partition causes dcpromo.exe to enable Strict Replication Consistency on any Windows Server 2003 domain controller that is promoted into the forest. The process of location is to use DNS to identify a set of candidate domain controllers from a list, based on SRV records. 3.) Dns will provide the list of SRV records of the Domain controllers, with that list workstation will try to reach any of the alive domain controller. The first step is to perform the DNS discovery. The DNS server returns a list of SRV records that match this request. If no records are available, then the domain location fails. If target hosts have the same priority, the client select a return SRV record according to weighted pseudorandom order. The client then resolves the SRV record to an address, again as specified in the DNS protocols. After each packet is sent, the client waits for a response, and if no response is received, it sends a packet to the next domain controller. The client continues this process until it receives a valid response that specifies the requested services or has tried all of the domain controllers. When a client tries to locate a domain controller after it has received the IP address from DNS, it varies the time it waits for a response based on the number of domain controllers it has already pinged. For the first five domain controllers, it waits for 0.4 seconds, and for next five domain controllers, it waits for 0.2 seconds. After 10 domain controllers have been pinged, the client uses a 0.1 second wait for the remaining requests. The domain controller server inspects the query and returns the NetLogon result. The response is typically returned in a NETLOGON_SAM_LOGON_RESPONSE_EX. Upon receipt of the LDAP SearchResultEntry, the client validates the capabilities returned by the domain controller. If the capabilities returned by the domain controller are incompatible with the requirements specified by the invoker of the locator algorithm on entry, the client must select another candidate domain controller from the list of domain controller SRV records returned above. Incompatibility in this case can arise because the client requested a Kerberos KDC, but the domain controller did not indicate that a KDC was present, or the client requested a domain controller that could accept writes, but this domain controller is read-only. These sorts of negative results are cached by the client. However, they are purged promptly (on the order of minutes). 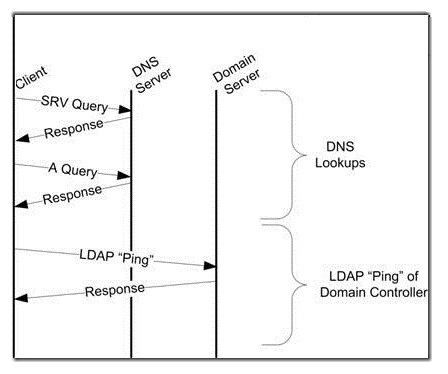 Because the LDAP “Ping” returns a snapshot of the current state of the domain controller at the moment of the query, services such as a time server, may not be running at the moment, but may be available once the server has completely started. If all the responses in the SRV records have been checked, and each SRV record points to a server that is either not available or does not match the requirements, then the location operation has failed. Upon successful response from the domain controller, the location portion completes. Basically the client either queries for a DC in the AD site it is in or it queries for a DC in the AD domain it is in. I have always asked myself why the DC locator process did not support following the site topology based on the site cost to find the next closest DC for authentication. The answer to that is unknown to me, but both Windows Vista and Windows Server 2008 provide an additional possibility that exists between “a DC in the AD site” (the closest end) and “a DC in the AD domain” (the far end). The new possibility is “a DC in the next closest site”. Each AD domain contains one system domain DFS that allows access to the SYSVOL and NETLOGON share. After a computer or user has been authenticated a referral is requested at the authenticating DC for \<Domain Name><SYSVOL or NETLOGON>. The authenticating DC creates two lists being one list with random referrals IN the same AD site as the computer/user and one list with random referrals OUTside the AD site of the computer/user. As you can see the authenticating DC is not by default (it can be however) also the DC that provides access to the SYSVOL or NETLOGON shares. It can thus be another DC in the same AD site as the computer/user that will provide access to the SYSVOL or NETLOGON shares. To make sure the authenticating DC in the same AD site as the computer/user is at the top of the DFS referrals in-site list an update needs to be installed on the DCs and a registry configuration needs to be made on the same DCs. For more information see MS-KBQ831201. 3. We are installing a Windows 2008 DC in a new domain/forest. This is the first DC of this forest. But while running dcpromo you select 2008 domain functional level. In the environment where the sites are located in different geographical locations, most of the administrators have confused with time services and how it’s works. Let me explain how the Time and Time sync works. I am not going to explain the Kerberos authentication process, just how the Kerberos uses the time for authentication. In Active Directory environment PDC emulator is acting as a time server, PDC emulator is located in the forest root domain and is connected to an external time source. The external time source holds the position of greatest accuracy, or stratum one. The PDC emulator is at stratum two. The forest root domain can also be called the parent domain, and each domain under the parent or forest root can be called a child domain. Any domain controller that accesses time directly from the PDC emulator of the forest root domain is designated as stratum. So on the whole, all the systems are uses UTC time, while displaying the system time it will be converted according to the time zone configuration. The W32Time service starts automatically on computers that are joined to a domain. For computers that are not joined to a domain, you can start the time service manually. On computers that are joined to a domain, time synchronization takes place when the W32Time service turns on during system startup. The Net Logon service looks for a domain controller that can authenticate and synchronize time with the client. When a domain controller is found, the client sends a request for time and waits for a reply from the domain controller. This communication is an exchange of SNTP packets intended to calculate the time offset and roundtrip delay between the two computers. Time passed to any client in the domain is unadjusted UTC time, which is adjusted to local time based on the time zone configuration of the workstation. Adjusting the time on the domain controllers will not change the time for the workstations. They have to be updated with the new time zone information as well. W32Time uses coordinated universal time (UTC), which is based on an atomic time scale and is the correct term to use when talking about time and time synchronization. UTC is the name for time that is independent of time zone. Time zone information is stored in the computer’s registry and is added to the system time just before it is displayed to the user. Then select your time and time zone. Unable to contact ip driver. general failure windows 2008 , R2. We got issue that user could not access their shares in Domain controller. Unable to contact IP driver. General failure. To solve the about issue we had done the below. As we can’t even ping the loopback address, it seems that the TCP/IP stack may be corrupted. 1)Run the cmd as administrator (operation requires elevation (Run as administrator). 2)Type netsh int ip reset in the Command Prompt shell, and then press the Enter key. Eventually pleasedownload and update the network driver to the latest version. If you server is VM, then goahead and update you VM tools.